Well.... I survived. The first week is finally over and I am completely exhausted. I think it is the mix of stress, nerves, hours of reading and just getting back into the swing of a school schedule. Overall, my first week was pretty darn good despite the Tornado warning and touchdowns in my area Wednesday night that sent my husband, pups and I to the basement for a little over an hour. That is certainly one of the more memorable parts of my first week. I only fumbled in class once, I mostly understood what was going on and I was able to complete all my readings and still find some time to take my dogs to the park, cook dinner and watch plenty of How I Met Your Mother. Thankfully I have no Friday classes so I can use that as a catch up day from this crazy week. Classes are interesting.... all the professors are so different. My Contracts professor starts class with Rock & Roll music while my Property professor uses Latin every third word. Civil Procedure doesn't allow laptops and has the most intense Socratic Method (still no Paper Chase though thank goodness) and my Torts professor is the most straightforward about the cases and what we should be taking from them. Legal Research and Writing is just a bit sporadic still. It is already becoming clear who are the "go-getters" in the class. There is one guy that raises his hand in every class with some crazy hypothetical and won't stop talking. He is obnoxious. He was even talking over our professor at one point!! I am nowhere near that level but I have raised my hand a few times and spoken up and only once did I fumble! The classes are engaging and easy to stay focused on at least. There are plenty of times I am completely lost but that is the minority thankfully. I have good seats in every class that are now assigned and I am with my friends each class which is awesome. Overall, class isn't too bad but it is still a big difference from undergrad. So. Much. Reading. I had 275 pages to be read throughout this first week. It is exhausting just in itself. Some reading is very quick and simply (Torts). Other reading takes forever and I still don't get it (Civ Pro). My eyes are exhausted; my brain is fried and there really isn't a break; I have a ton more due on Monday. Everyone says it is a learned skill you get used to and I hope that kicks in soon. Until then, books and highlighters rule my life. I am SO thankful I have made 3 close friends thus far. Having them to fall back on, ask questions and confirm that that case really made zero sense is so comforting. It makes the confusion and exhaustion better because you are not the only one feeling that way. We sit together in all classes except for Legal Research since we all have different teachers. I am so glad to have a group of friends already and even outside of Law School related things, we have a ton in common and spend a lot of time laughing over lunch. Law School attire is interesting. I have seen everything from full suits to shorts and t-shirts. 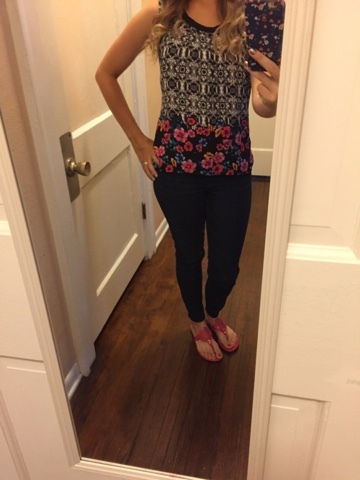 Most of the 1L's are sticking to a classy casual style; I have worn skinny jeans/capris, a nice top and flats each day. I make sure to do my hair and makeup nicely. I want to project a good image from the start with my classmates, professors and anyone else who might be in the school. 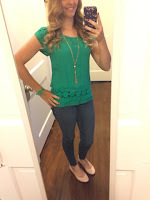 For example, when I met the Themis head representative, I did not feel frumpy in my outfit. I felt comfortable classy enough to interview with her on the spot and feel that I had made a good impression. You never know who you will see/meet at the school so it is better to lean on the nicer side. The people wearing sweats, shorts and t-shirts just look out of place and frumpy this early in the semester; it seems like they already gave up. Below are a few of my outfits from this week. I felt appropriately dressed each day. Balancing Law School with my life is interesting. It is challenging to come home from school all day and try to get dinner ready and have some time to spend with the hubby and maybe take the pups to the park. I am learning that time management is huge and I am working to improve that. To-do lists, my planner and this new hourly lay-out I found is making it all happen right now. Having Fridays off is great because it is my day to just catch up on everything with no responsibilities. I am sure my time management and balance skills will improve with time but it is a learning curve thus far. Our student organization fair was Wednesday. It was a whole lot of information and people talking to you about things to do. 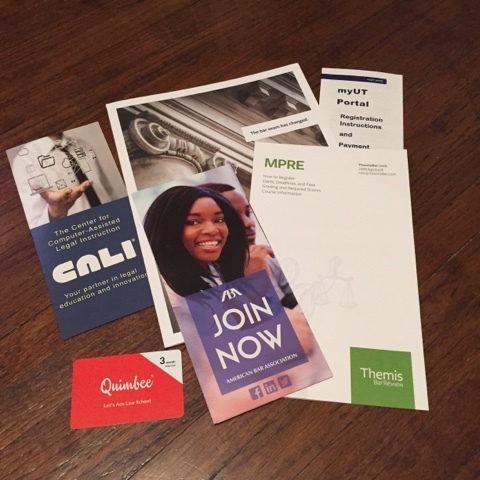 I am thinking about doing Woman's Law Association, some sort of Criminal Law club (there are 3 options) and I am becoming a student representative for Themis Bar prep. For this year, I think that will be plenty. 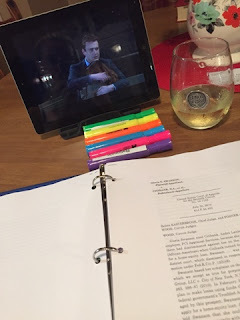 Law School is hard. People are super intense. Professors are not here to hold your hand. 2L and 3L's are super nice and helpful. Outlines seem to be a thing we should be doing but the idea is so foreign and vague to me that I have no idea where to start. Making a few good friends is awesome. Making time for relaxing, Netflix and my hubby is still very important. Law School can take over your life if you let it so don't. Make time to put the books down. 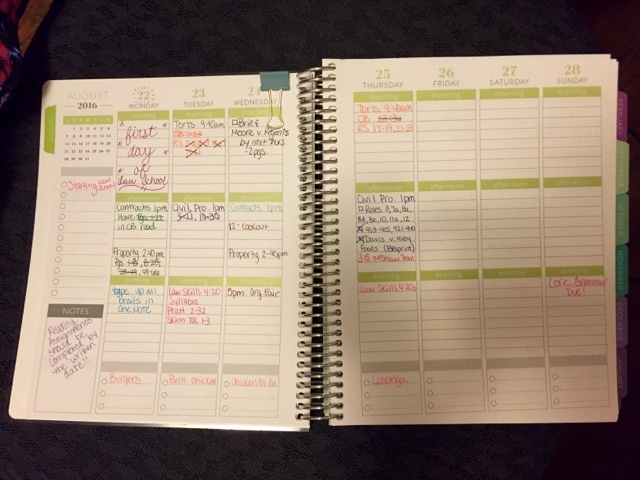 You will feel stressed, nervous and clueless the first week no matter what you do to prepare. I thought I was prepared beyond prepared and there were still times that I was completely lost and felt like I should not be there.... but then I look around and realize that everyone is the exact same way. It is not going to be easy and it is not supposed to be easy but it is a means to an end. The end will be worth it. Week 1 down, a ton to go. 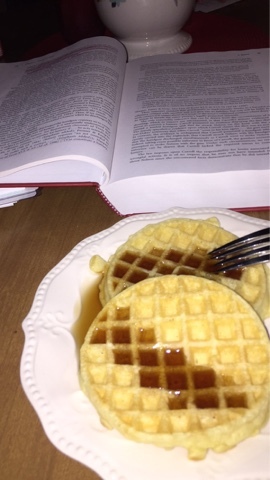 Check out some of my snapchats from this crazy week: wine, waffles, Netflix and always the Casebook. Love you posts! I too just started law school at Northern Illinois University and feel the same way you do. I also have a husband and two pups and I'm getting used to balancing my time with them and with law school. I also loved looking at your pictures-I have that same red Camelbak water bottle from Lexis lol!! Hi Lauren! Thanks for reading! 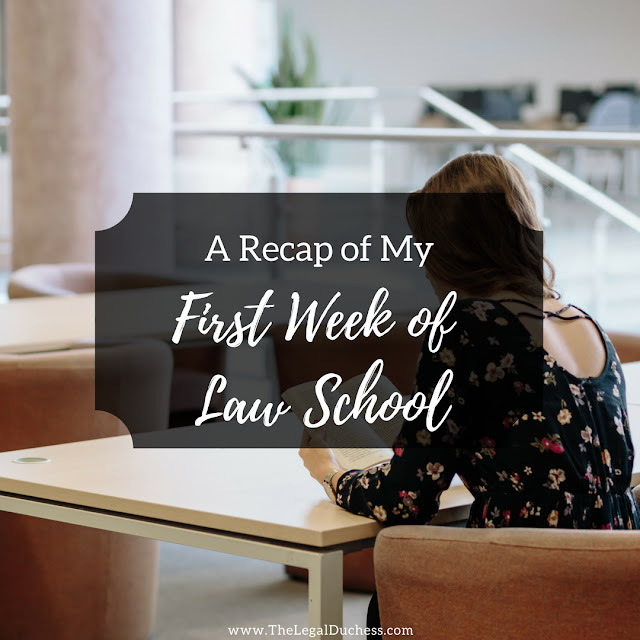 I hope your first weeks of Law School are going well. Juggling the hubs, pups and law school is a big learning curve. I am still figuring it out. Hopefully it will get easier in time. I am glad I am not the only one out there struggling with this situation. I wish you the best of luck!